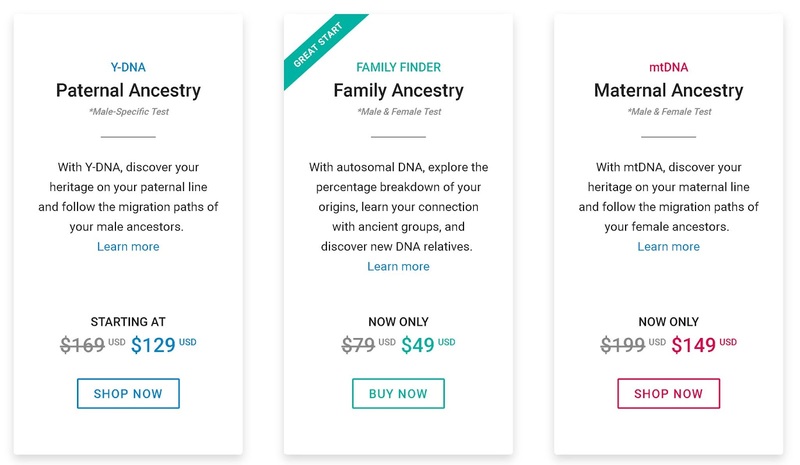 Until Saturday 27 April British DNA testing company Living DNA is offering its test for 30% off – reduced from $149 to $99 for Canada. That does not include shipping. Go to https://livingdna.com/ and select your country top right. We are all complicit. This day take a few minutes to think about your environmental impact. That frequent flyer status you qualify for is also testimony that you contribute much more than your fair share to climate change. What's being done with autosomal DNA test results beyond genealogy? This study uses results from 23andme as well as the UK Biobank study to look at risk. If you struggle with the more technical blog posts you may want to skip this one; I found the first part is quite understandable. From last January, University of Toronto Economics Assistant Professor Jonathan Beauchamp presents his research focused on the emerging field of "genoeconomics" - who knew! "It may seem unfathomable that tempers have continued to run so deep with friction remaining stubbornly close to the surface. Yet the protagonists have been slow to forgive and forget, jeopardizing continuing efforts to secure a lasting peace." As I write the shooting death of journalist Lyra McKee by dissident republicans in the Creggan area of Londonderry is just the latest episode in that long history. If like me your knowledge of Irish history had been previously informed by Flanders and Swann "blame it on Cromwell and William the Third" and the famine of the 1840s this lengthy book aims to give a perspective on the deeper historical roots. Part 5 Britain's determination to retain control over Irish government. Part 7 Events leading to Union and emancipation. Part 8 Famine, destitution and agitation for independence. Had the Reformation not happened at least one source of discord would have been avoided, perhaps only temporarily. Blame it on Henry VIII. Although no expert I was surprised there's no mention of the 1601 Battle/Seige of Kinsale described elsewhere as "the ultimate battle in England's conquest of Gaelic Ireland" and "one of the most important battles in Irish history. It finally brought success to England in its fight to conquer Gaelic Ireland." 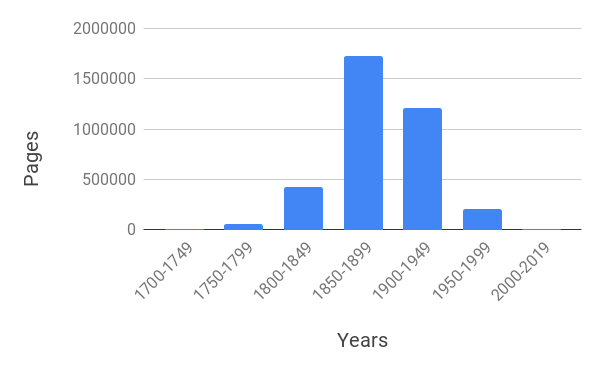 Although the famine of the 1840s is well known I was not aware that the period 1739 - 1744 famine caused a greater proportional fall in the Irish population than in the 1840s. Frequent references to absentee English landlords made me wonder if they were so much worse than those of us with investments in stocks, mutual funds, and even pension assets who don't know the social implications of our investment. How many are employed on a minimum wage or one that's inadequate to house, clothe and feed the family? Are the companies you're invested in socially and environmentally responsible? Regarding a previous book by Stedall one reviewer commented that it quoted at length from earlier books — musing as to when quotation, even if given a citation, calls into doubt the originality of the work. I don't think that's entirely fair. There's nothing wrong with presenting material that may have been written for an academic readership or is now dated, for a general audience. For example, in chapter 29 on The Rise of Charles Stewart Parnell 1874-1882 all but 11 of 45 references are to T.P. O'Connor, but the version referenced is from 1891. The same cannot be said for the extensive references to Jonathan Bardon's 2011 book on the Plantation of Ulster. There is a single map showing the provinces and counties of Ireland and eight pages of b/w portraits and photos grouped following page 184. Rounding out the volume are a 9-page bibliography, 29 pages of references and a 37-page index. And strangely, there's not a single reference to a website! The Ottawa Public Library’s second annual Discover Your Roots: Genealogy and Local History Fair, presented in partnership with the British Isles Family History Society of Greater Ottawa (BIFHSGO) is taking place Saturday, 27 April, 10 am to 3 pm, at Ben Franklin Place, 101 Centerpointe Drive. Leanne Cooper shows you how to manage the results of your DNA test. Stuart Clarkson, Archivist, City of Ottawa Archives. Throughout the day, you can visit displays from local museums, historical, and genealogy societies; or bring your questions to the genealogy specialists from OPL and BIFHSGO in the Resource Rooms. The Irish Genealogical Research Society Early Irish Birth, Marriage & Death Indexes are augmented by 8,325 births and 5,000 marriages drawn from lesser known or underused sources. The total number of names noted among the births is now 70,000 and for marriages 213,000. The Ottawa Public Library’s second annual Discover Your Roots: Genealogy and Local History Fair, is taking place Saturday, 27 April, 10 am to 3 pm, at Ben Franklin Place, 101 Centerpointe Drive. Discover Your Roots is presented in partnership with the British Isles Family History Society of Greater Ottawa (BIFHSGO). In the 2019 Ontario Budget the Ministry of Tourism, Culture and Sport (Michael Tibollo is Minister) received a budget cut that is being implemented heavily on the Southern Ontario Library Service (SOLS) budget — just over a 50% budget cut in the current 2019-20, fiscal year. There will be a similar cut to the Ontario Library Service-North. While the full impact is unclear SOLS interlibrary loan delivery service will permanently cease effective 26 April 2019. OPL cardholders now have free access to equipment for DIY image scanning (scan and digitize photographs, slides, negatives and save them to USB or to the cloud, VHS conversion (record DVDs of old VHS cassette tapes; and conversion of 8mm and Super 8 films to SD card. I ventured out to Beaverbrook (Kanata) to try the image scanning of slides and film negatives using the equipment in the photo. After a brief training session from Jennifer, the OPL staffer in charge, I was able to successfully digitize both types and save to my USB drive. The trickiest part was getting accustomed to how things are done on a Mac. Quality of the digitized image was excellent. Depending on the resolution set, I chose 600 dpi, scanning can take a while. It's a good idea to carefully select the material you want to digitize before you arrive. There are limits on how much time you can reserve and how often. There were two others in the room using other equipment while I was there. If it continues to be so popular I'd imagine other branches might also acquire similar equipment. Read an OPL blog post about the official opening of the facility. One result of a genetic genealogy test is the amount of DNA shared with another tester expressed in either centimorgans (cM) or percent. How does that amount of shared DNA translate into the relationship? Sadly it's not unique and the smaller the amount shared the broader the range of possible relationships it implies. The relationship can only be expressed as a probability. Suppose based on the amount of shared DNA, say 200 cM, there's a probability the relationship could be second cousin. It's a conditional probability which statisticians write as P(A|B) where A is the second cousin relationship and B the 200 cM of shared DNA. To help the interpretation Blaine Bettinger's Shared Centimorgan Project compiled statistics of the distribution of shared cM for a given relationship. Using the same terminology, it's expressed as the conditional probability P(B|A). P(B|A) is not necessarily the same thing as P(A|B). If it were the probability that a black animal is a dog would equal the probability a dog is a black animal. Bayes Theorem tells us how P(A|B) and P(B|A) are related. P(A) and P(B) are the probabilities of observing A (the relationship) and B (the amount of shared DNA) independently of each other; known as marginal probabilities. Only if P(A) = P(B) will P(A|B) = P(B|A). How do you determine the marginal probabilities? You establish an unbiased domain which is the same for both P(A) and P(B). A community known to dogs that are black would not be unbiased. The domain could be the world. How many second cousins do you have? Perhaps 100? With a world population of 7.7 billion the marginal probability P(A) = 100/7.7 billion = 1.3 x 10E-7. But with how many people in the world do you share 200 cM? As only a few tens of millions of people have taken a DNA test, and a large fraction of those are in the USA how do you know the worldwide figure? You don't. You might choose a domain such as all people who have taken a DNA test or tested with a particular company. In theory, you might know how many of those match at 200 cM (within a narrow range) but how would you know how many second cousins tested? You might choose the domain of all those who responded to the Shared cM Project call. Everyone who did so was able to confirm the shared cM for a particular relationship. For a second cousin, the average was 233 cM with a range of 46 to 515 cM. The project found 18 other relationships where 200 cM was within the range of shared cM values found. However, there's evidence that the Shared cM Project dataset is not an unbiased domain. The average amount of DNA for a given relationship is higher than would be expected from theory. That's shown by comparing the fourth and the final column in the table. And in terms of percent, the difference becomes more significant the more distant the relationship. That's what would be expected if one failed to establish a link when it existed. The capability, and maybe motivation to establish it is less for less shared DNA, especially for cases where the relationship is more distant and possibly obscured behind a genealogical brick wall or hidden by misattributed parentage. Another factor is endogamy. Specific results in Table 3 at https://thegeneticgenealogist.com/wp-content/uploads/2017/08/Shared_cM_Project_2017.pdf show that people from an endogamous population share more DNA than would be expected from the closest relationship as they are also more distantly related. The Shared cM survey shows that for a fourth cousin, where the expected shared DNA is 13 cM, those from non-endogamous populations share an average of 33 cM while endogamous populations share an average of 53 cM. While looking further into this I noticed the ratio of the number of endogamous to non-endogamous cases reported changes systematically as the relationship becomes more distant. For 1st cousins, endogamous cases are 15% of the total, for 2nd cousins 12%, 3rd cousins 10% and 4th cousins 9%. Why would endogamy decrease for more distant relationships? Likely people don't know about endogamy for more distant relatives. If you read this far — congratulations. The bottom line is the marginal probabilities P(A) and P(B) are not equal, although for larger amounts of shared DNA they may be close enough that the difference is insignificant. Moving to smaller amounts of shared DNA relationships are likely more distant than the assumption P(A|B) = P(B|A) often applied to the Shared cM Project sample implies. FamilySearch captured images of original Diocese of Durham Bishop's Transcripts held in the Durham University Library are now available linked to transcriptions by Findmypast. The Diocese of Durham has seen changes over time — this collection includes records from modern-day Cumberland, Northumberland, and Yorkshire. 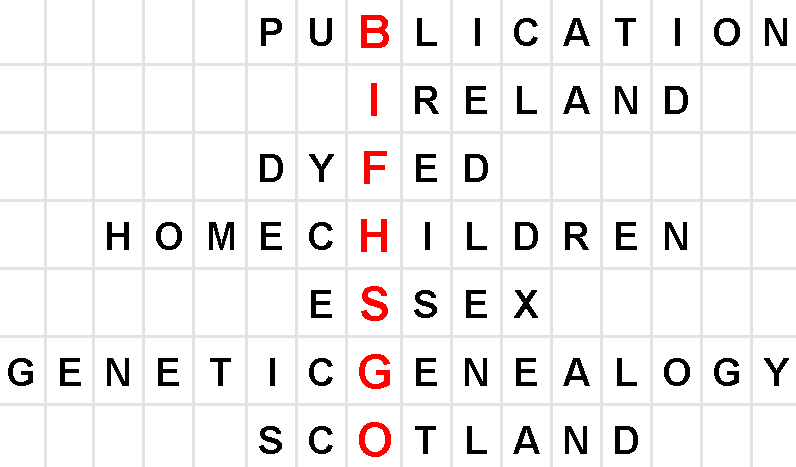 A full list of the available parishes is available within the Durham Bishop's Transcripts parish lists. 741,689 records have been added in the collection of Bishop's transcripts, contemporary copies of parish registers usually contain baptism place, baptism date, residence, parent's names and father's occupation. 291,166 transcripts of marriages are now available and include both images and transcripts providing marriage date, marriage place, father's name, witness's names and corresponding details for their spouse. 539,504 new burial records have been added providing evidence of burial place, year of death and religious denomination. The records are copies of original parish registers and contain records of both Anglican and Quaker burials. The NBI adds over 410,000 additional records. This latest update includes new records covering a variety of locations across Essex, Bradford, Durham and North Yorkshire. Each record consists of a transcript with birth year, death year, burial date, burial place and denomination. A collection of Jamaica records is added: five new sets encompassing over 2.4 million parish and civil register entries for births, baptisms, marriages, deaths and burials dating back to the mid-17th century. Findmypast is a commercial site. Free access is available at LDS Family History Centres. "Scrapbooks: Preservation and Increased Access" is a newly funded Documentary Heritage Communities Program project. It might be of interest to some in the family history community. I enquired to the Whyte Museum of the Canadian Rockies for further details. What is the source of the scrapbooks? What time period do they cover and for what communities or notable people? The scrapbooks are representative of the Canadian Rocky Mountain community from upper and middle-income families from the 1800s to 1970s covering topics such as ‘pioneer’ life in Banff, travels on the Canadian Pacific Railway, political events, scientific and anthropological studies, family life and events in various communities in and around the Canadian Rocky Mountains etc. How much material - pages, books? 160 scrapbooks from 48 fonds – a total of ~6197 pages for this specific project, and an ongoing focus on rare books, newspapers, photograph albums. What will the preservation work involve? The Bookeye 4V1A book scanner will allow for the digitization of oversize or bound items without disassembling them. They will be preserved in a digital format and described and the originals will benefit from the reduction in physical handling. Scrapbooks present a multitude of preservation challenges due to the quality of papers used, adhesives, acidic newspaper clippings and the book's bindings. Each scrapbook will be assessed separately to determine the appropriate preventative care needed. Preventative conservation may include interleaving with acid-free paper and/or mylar for loose pages and providing supports. How will that work be carried out - in-house, contract, volunteers, new staff? This project provides funding to hire a Digital Imaging Technician for approximately 174 days of scanning, 22 days of embedding metadata in the digital files, 25 days of preventative conservation, and 124 days of metadata description and 1 day to upload digital images to the website for digital access. This technician will follow the Whyte Museum of the Canadian Rockies Archives & Library digitization and preservation workflow to ensure digital archival standards are followed and met. How will increased access be achieved? This project will increase access to records of significant historical value both locally and nationally by creating digital surrogates that are placed on the web to be freely accessible to a wide public audience to increase the knowledge of history, encourage research and enhance the user's knowledge and understanding and preserve the original document for future generations. Free digital access allows for individuals and organizations in remote areas to utilize primary materials that would have been previously inaccessible and unknown sources. Scrapbooks are a combination of textual and visual materials that may be useful for those of official language minorities who can gain context and knowledge through visual materials. The digital surrogates of the scrapbooks will be available on a new online database (coming soon), as well as the Archives Society of Alberta’s database Alberta on Record as searchable pdf’s with associated descriptive metadata and will be featured on our Digital Vault and social media platforms. Thanks to Lindsay A. Stokalko, Whyte Museum Reference Archivist/Librarian for the information. Here's an update on Co-Lab projects since last month. Legendary Train Robber and Prison Escapee Bill Miner is 58% complete (56% last month). The Call to Duty: Canada's Nursing Sisters is 74% complete (72% last month). Rosemary Gilliat (Eaton)’s Arctic diary and photographs is 35% complete (34% last month). New France and First Nations Relations is 39% complete (22% last month). War Diaries of the First World War: 1st Canadian Division is 92% complete. Japanese-Canadians: Second World War is 64% complete. The Spanish Flu Pandemic of 1918–1919. Correspondence between Sir Robert Borden and Sir Sam Hughes. Letters from Wilfrid Laurier to Zoé Lafontaine/Laurier. 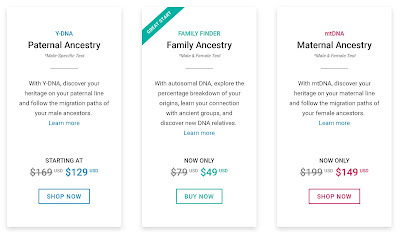 Up to 30% off Family Tree DNA tests. Includes $200 US off the BigY 700 test which examines 700 short tandem repeats and 100K SNPs on the Y chromosome. Now $449 US, for a limited time. The National Library of Scotland has placed online a digitized collection of over 60 town plan maps of Scottish towns by mapmaker John Wood (1780-1747). If your ancestor set sail from Stornoway for Canada the Plan of the Town and Harbour of Stornaway, Island of Lewis, from actual survey. 1821 might be of interest. From 1822 there's Map of the ten parishes within the Royalty and the parishes of Gorbals Barony of Glasgow. 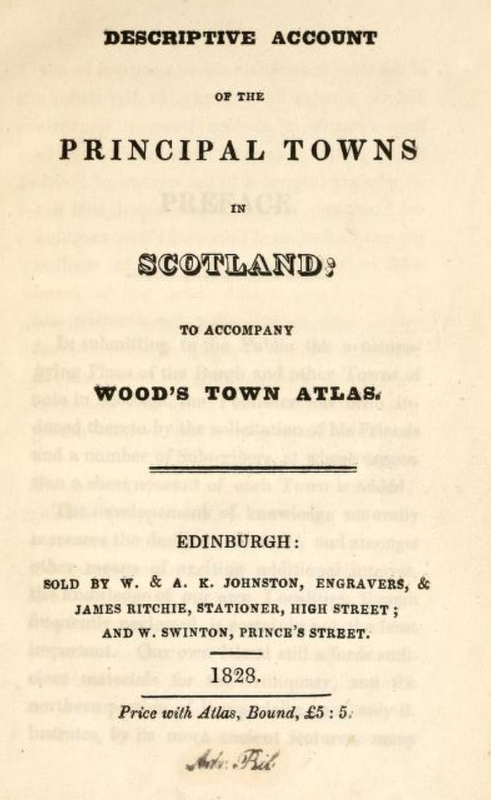 Each map is linked to a description from an 1828 publication Principal Towns of Scotland to Accompany Wood's Town Atlas from the Internet Archive. The following is an extract from a 16 April AMBA press release giving details on one of the 12 Ontario Documentary Heritage Communities Program projects funded by the LAC for 2019-20. ARNPRIOR, ON— The Ottawa Valley has a deep and rich history linked to the lumbering industry and one of the most influential people from that era was Daniel McLachlin. McLachlin was a lumber baron, entrepreneur and politician. He is considered by many to be the true founder of the Town of Arnprior. As part of its mandate to acquire, preserve and make accessible important historical documents relating to our local region, the Arnprior and McNab/Braeside Archives (AMBA) is launching a new project to explore McLachlin’s legacy. The project will digitize and provide online access to the historic letters, ledgers, maps, plans and images from that era. From shanty accounts to personal correspondence, we will shed light on the life and activities of one of Arnprior's most influential residents. 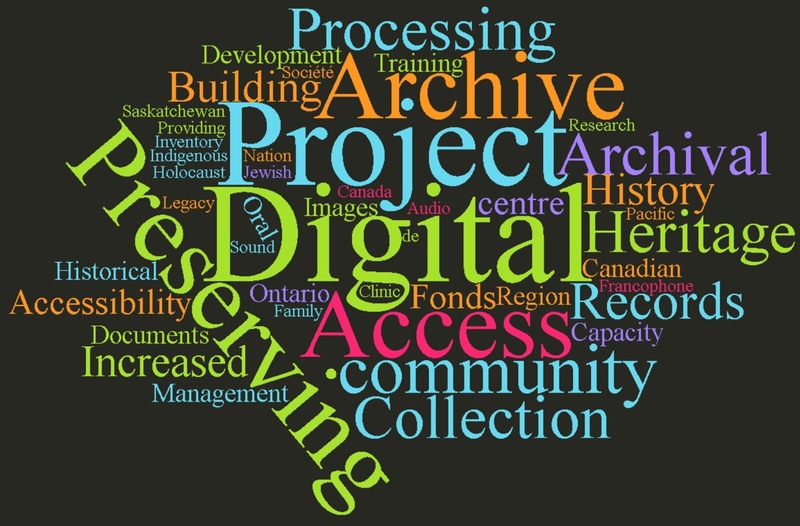 Funding for this project comes from the Documentary Heritage Communities Program (DHCP) of Library and Archives Canada (LAC). The DHCP provides $1.5 million annually to support projects by archives, libraries and documentary heritage institutions throughout Canada. AMBA will receive $49,568 in 2019-2020 for its project Daniel McLachlin's Legacy: Exploring the Lumber Era of the Ottawa Valley. Work will begin shortly with the goal to finish in Winter/Spring 2020. 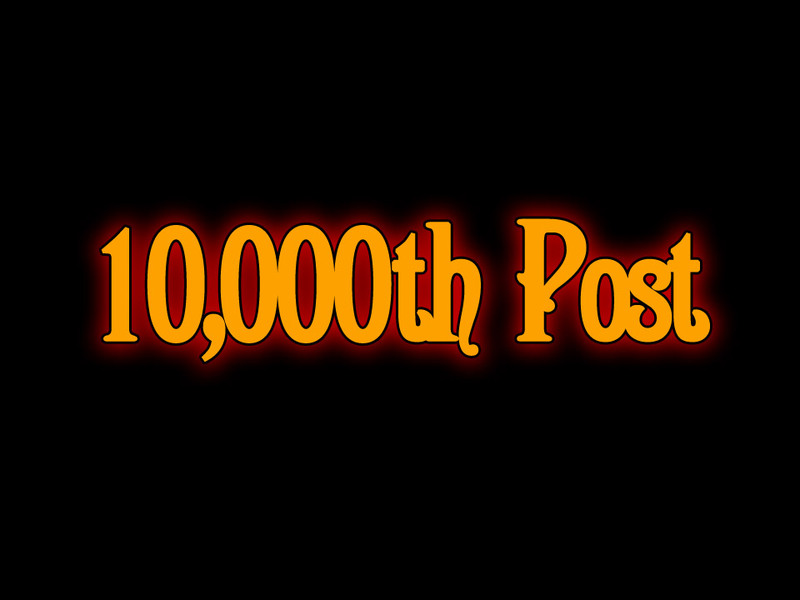 A launch date for the online material will be announced closer to the completion of the project. I spoke to Emma Carey, AMBA Archivist to find out more details. The project will digitize and provide online access to the historic letters, ledgers, maps, plans and images from approximately 1852 to 1929. Besides protecting the delicate originals from further handling, it will provide access to rare documents of the timber industry. These include a 1890/91 shanty accounts ledger; a circa 1900 manuscript on life in the lumber camps with 80+ images; timber limit maps; and plans of piers, mills, railways, and a log slide. McLachlin’s 600+ letters from 1834 to 1857 provide insight into both the business and personal life of this community leader. While some of the digitization will be outsourced much of the delicate and oversize material will be processed within the archives by community volunteers using newly purchased equipment. The AMBA website will be updated to create more dynamic user experiences. This will include an image zoomer (for looking closely at large digitized maps); a map feature to link photographs and documents with geographical locations and, a flipbook viewer for more easily viewing the manuscript and ledger books. 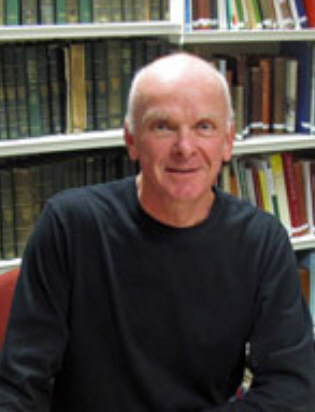 "Early Loyalist Roots of the Lower Hudson River Valley and New York" presented by Brian Laurie-Beaumont. Everyone welcome, bring a friend to Quinte West Public Library, 7 Creswell Dr, Trenton. 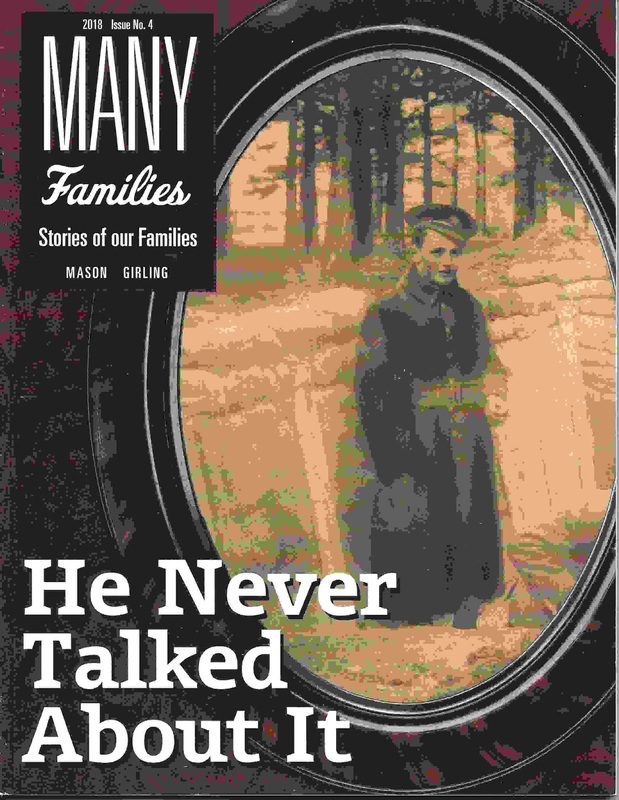 I've been following progress on Tad and Terry Findlay's project to produce magazine format books on their family histories. The first issue came out in 2015 with the objective of producing one a year. Three came out on schedule, No. 3 in June 2017. Then life got in the way! Last weekend Terry slipped me a copy of No. 4 which I insisted on paying for, they're that good. The contents in this issue are 11 articles on the Mason and four on the Girling families, 12 on the First World War and nine on Researching. That's 36 articles in 144 pages. About half the space is taken up with photos, maps and other visual material so the average article is two pages, many in the Research section are just a single page. Even with much white space narrow margins means there's no skimping on textual substance. Some of the longer articles are: No Ordinary Story, Fraternal Societies in Early Ottawa, Go West Young Man, Canadian Expeditionary Force: A Primer, He Never Talked About It (26 pages including images), The Raid That Saved His Life, Casualty Evacuation: From the Western Front to Blighty, 1918, Writing about Ancestors with Unknown Military Service, He Fought at Passchendaele. The content is more than just about the families. In reading some of the articles on the Mason family I was struck by how there was more than one instance where no conclusion about a genealogical fact could be drawn. Many of us would be deterred from writing, insisting more research is needed. Terry demonstrates the thrill that draws readers in is the chase. Another thing demonstrated near the start of the volume is that the very best way to find an error in your writing is to publish. It's minor but would grant someone an extra two months or life. An infographic on seniors internet use just published by StatsCan is based on the General Social Survey (Canadians at Work and Home), 2016 and General Social Survey (Social Identity), 2013. Three-year-old data! It's not as if StatsCan isn't aware of the importance of timely information as indicated in the recently tabled Departmental Plan 2019–20. The agency is also modernizing to keep pace with today’s data-driven economy and society, aiming to provide more timely, detailed and high-quality data and insight. Statistics Canada has earned its reputation as a world-renowned statistical agency that provides high-quality, timely and credible data that responds to the information needs of Canadians. Three-year-old data! The Chief Statistician should stop deluding himself about timeliness at StatsCan. Just look at the UK Office of National Statistics, for example. They publish estimates of deaths weekly, the latest is for the week ending 29 March 2019. StatsCan publishes deaths by month, the most recent being for December 2017. Sadly, despite the word timely appearing in the Departmental Plan nine times not one of the departmental result indicators refers to timeliness. From Maurice Gleeson, ISOGG Educational Ambassador, a short lecture presented at the Personal Genomes: accessing, sharing & interpretation conference, Wellcome Genome Campus, Cambridge, UK on 11-12th April 2019. Why am I mentioning this web mapping app showing the last-known parish for all 1,795 emigrants whose origin is confirmed, about a third of the nearly 5,700 emigrants who left England (and a few other places) for New England between 1620 and 1640? It would be interesting to see a similar map for, say, British home children, war brides, those interred in a particular cemetery. The following is a notice from the Perth & District Historical Society. Although our Society’s mission is primarily to learn about our local history, culture and heritage, we sometimes take a circuitous route to it. For this month’s meeting, we will go beyond our local borders to a wider world of heritage buildings of our area, of Canada and abroad. All too often, the focus of the study of our heritage, and activities to protect it are on the old stories and records, and we overlook the physical structures in which it all took place – and which have their own stories to relate. Unfortunately, this aspect is, at times, forgotten until it is too late, and the cost of restoring too high. For many reasons, stone buildings usually receive a higher priority for restoration (note the present work on Parliament Hill). Wooden structures, despite being equally significant to our heritage, are often overlooked, because they are more susceptible to the ravages of time and neglect. Consider the old wooden barns of this area or the traditional wooden grain elevators of the Prairies. The restoration of such structures requires different technology, as well as a more sensitive approach. Jack Hollinger, our guest for this month, grew up in Ferguson’s Falls and attended PDCI. His post-secondary education includes two undergraduate degrees from Queen’s University, plus programmes in Heritage Carpentry and Joinery at Algonquin College – Perth Campus. At the Perth Campus, he has been teaching the Heritage Carpentry and Joinery programme for the past 10 years and overseeing it for the past four years. He admits to a passion for trees, wood and the things we can make with it, with a special interest in traditional methodologies. Hollinger and his wife of 15 years, Donna Klassen, have two sons. Jack’s work experiences have taken him to The Northwest Territories, the Laurentians of northern Quebec, Lanark County and Colorado. Further afield, he has been to Norway to study wood architectural conservation, especially their unique stave churches, most recently as a guest instructor on traditional wooden building techniques for ICCROM in Oslo Norway. In addition to the Norwegian experience, he was chosen to be a member of a group of heritage carpenters and professionals from around the world for a course on wooden architectural preservation focussing on the restoration of the most iconic Church if the Transfiguration on Kizhi Island, Karelia in northwestern Russia. Jack Hollinger will talk to us about traditional craftsmanship in the Russian North, Norway and Canada. He will review the differences between these locations, what we can learn, where the field of heritage carpentry can contribute to preserving our history, and lessons that can be applied to looking after our own neighbourhood. Such are the benefits of having a world-class heritage carpentry professional in our midst! 26 Beckwith Street E., Perth, (Toonie Donation). 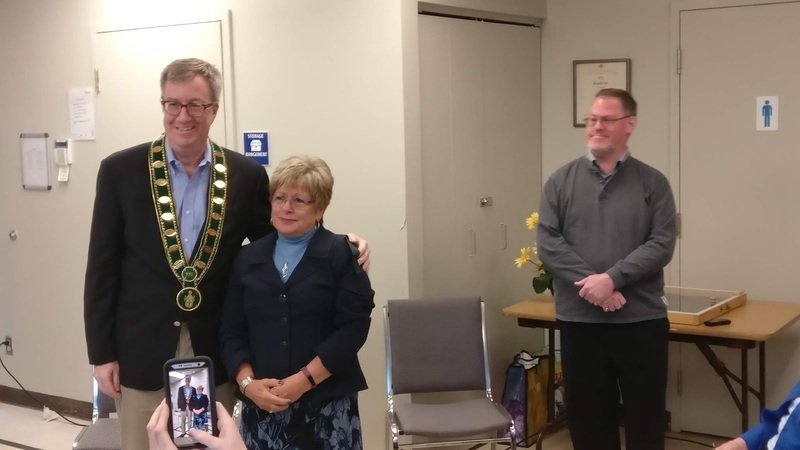 On Sunday afternoon a bit of history was made when the green and gold mayoral chain of office for the former City of Gloucester was passed from the last Gloucester mayor, Claudette Cain, to Ottawa mayor Jim Watson. The ceremonial chain, which had been in the custody of the Gloucester Historical Society, joins those of the other municipalities amalgamated with Ottawa in the care of the Ottawa City Archives. City Archivist Paul Henry was present to take custody at the conclusion of the ceremony. Sourced by Ancestry from the company Wilmington Millennium, West Yorkshire, these updated records give you a 50/50 chance of finding an entry for the event during the time period. Scotland and Northern Ireland, Death Index, 1989-2017 has 526,913 records covering approximately 45% of the total deaths that occurred in this time period. 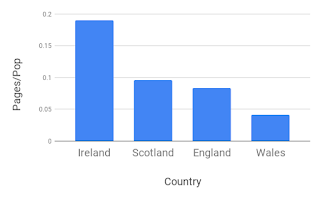 England and Wales, Death Index, 2007-2017 includes 2,194,898 records covering approximately 55% of the total deaths that occurred in this time period. Each entry gives name, gender, age, birth date (from age), death date, last residence (town), postal code (the first part giving better resolution than the last residence). The FreeBMD Database was updated on Friday 12 April 2019 and to contain 269,607,959 unique records (269,239,094 at previous update). Years with major additions, greater than 5,000 records, are: for births 1964, 1978, 1980, 1982, 1984-87; for marriages 1965, 1980, 1984-85; for deaths 1983-86. The 2019-2020 Departmental Plans, including that for Library and Archives Canada, were tabled in the House of Commons on Thursday 11 April 2019. LAC's 2019-2020 Main Estimates expenditure is $94 million. That compares to $60 million for 2018-2019. Spending increases because of almost 35 million dollars dedicated to substantial completion of construction of a new facility for the preservation of analogue documents in Gatineau, Quebec. 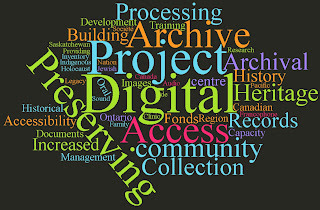 Focusing on the part of LAC's activity of most interest to genealogists "Providing access to documentary heritage", Main Estimates expenditure for 2019-2020 is $31 million, unchanged from the previous year and maintained in the following year forecast after which it increases by $9 million to support the LAC - Ottawa Public Library new joint facility at 555 Albert. The 2019-2020 human resources of 287 FTEs, up from 243 FTEs in 2018-2019 is planned to decrease in subsequent years because of the discontinuation of funding for the Indigenous languages and culture preservation initiative announced in Budget 2017. 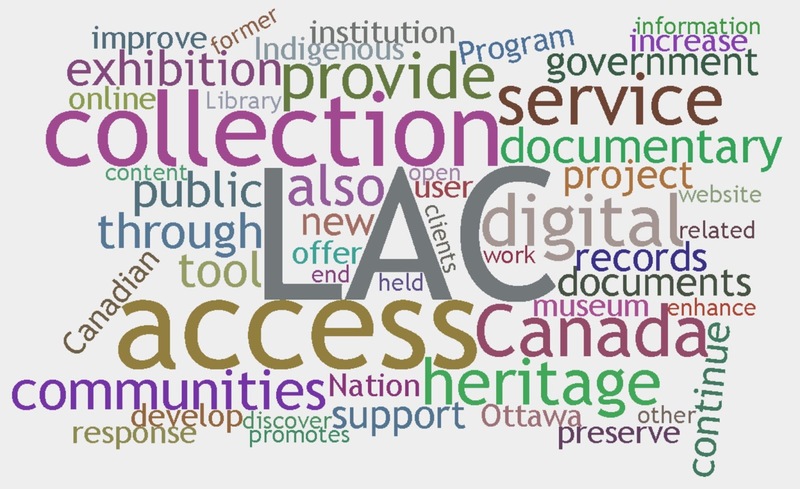 - LAC will begin developing a virtual reading room and will digitize the finding aids and reference tools held at 395 Wellington Street in Ottawa. 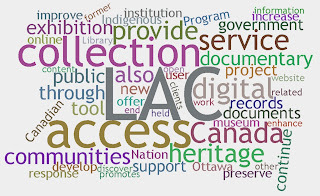 - LAC will continue to develop new tools to enhance access to its collection. It will improve the online search experience by indexing additional databases. - Co-Lab builds in new functionalities and proposing new (transcription and description) challenges to its users (and) restores full value to digitized documents by making them more searchable and accessible; for example, for clients who use a voice synthesizer or screen reader. - We Are Here: Sharing Stories will see the digitization of hundreds of thousands of documents, photographs, maps and other material of importance to Indigenous communities as well as the creation of online content. - Listen, Hear Our Voices will continue to provide Indigenous communities with the support required to preserve their oral recordings. To this end, LAC will provide services to communities, such as digitization, deposit preservation, and the development of a catalogue of existing expressions. - LAC will test a new way to increase the visibility and accessibility of its collection. It will conduct two pilot projects to develop an augmented reality application, i.e., a virtual interface that can enrich reality by superimposing complementary information on it. One relates to the Dominion Textile collection and related LAC material, and the other to the Proclamation of the Constitution Act. Comment: As in the bottom right of the word cloud, continue is a theme this year. Indexing additional databases is mentioned without any detail. Major or minor? I was surprised to find digitization of Vernon directories from the LAC collection being undertaken by FamilySearch is not mentioned. In fact no mention of OCR initiatives at all. One file I processed through DigiLab into a pdf was then OCRd, nothing like a perfect transcription of course. No indication of whether this will become available in a searchable format when LAC makes it available online. If not why not? And why not for other files? If you have a public profile for your Ancestry account, and if you use the messaging application to communicate with matches you'll find changes, mostly improvements being made in the next few days, if not already. "The spirit of William Hogarth runs vividly through Orphans of Empire, Professor Helen Berry’s latest book, which explores the story of what happened to the orphaned or abandoned children of London’s Foundling Hospital ... the brainchild of Thomas Coram." A study of the Swing Riots of the 1830s in England using digitized newspapers brings new insights to the diffusion of the threshing machine and severe labour unrest in wheat-growing areas which was mitigated in parishes where more generous Poo Poor Law support was provided. The pdf was a very slow download. Links at www.myprimitivemethodists.org.uk/, www.mywesleyanmethodists.org.uk/ and www.mymethodisthistory.org.uk — a tip from Jane MacNamara who was impressed with the content and usability. BTW: check out Jane's blog Where the story takes me… for well researched Ontario posts back to 2012. You can now limit your results from a Google search by adding before:yyyy and/or after:yyyy, or get more precise using dd/mm/yyyy. Google seems to have stopped comprehensively indexing the internet for its Search. Certain old websites — those more than 10 years old — may not show up through Google search. Lifehacker suggests alternatives. BTW, if you're concerned about the lack of privacy on Google try DuckDuckGo — not as good as Google but pretty good. From the New Yorker. It's from 2017 so some of the "current" references are dated. A relatively modest addition this week, over 23,000 new records from the English county of Devon. With these additions, the total Devon Baptisms collection is 2,706,855 records from 1529 to 1999. Devon burial records are augmented with those from the parish of Northam. The collection now totals 2,110,592 records from 1320 to 1988. The sum of money paid on the property. There are now 259,054 records from 1777 to 1910.